Ngā Tamatoa and Te Reo Māori Society Incorporated organised a petition to Parliament in 1972 asking that the Māori language be taught in schools. Members of Ngā Tamatoa then settled in for a three-week protest in the grounds of Parliament. 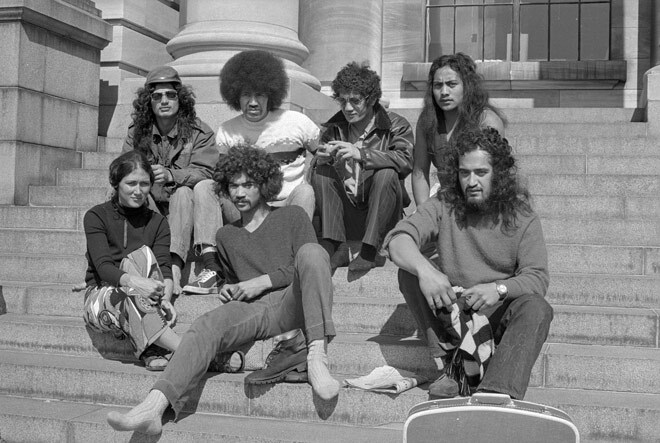 They are (from back left) Toro Waaka (Ngāti Kahungunu), John Ohia (Ngāi Te Rangi, Ngāti Pūkenga), Paul Kotara (Ngāi Tahu), Tame Iti (Ngāi Tuhoe), and (from front left) Orewa Barrett-Ohia (Ngāti Maniapoto), Rawiri Paratene (Ngāpuhi) and Tiata Witehira (Ngāpuhi).